Fire doors play a vital role in the compartmentation of a building to delay the spread of fire from one area to another, contributing to effective fire safety in buildings. These fire doors require intumescent edge seals to resist fire spread and where specified provide additional smoke and acoustic control. Pyroplex manufacture a variety of intumescent seals all of which have been tested and certified for use in leading manufacturer’s doorblanks. The Flipper range offers a rebated all-in-one solution to meet fire, smoke and acoustic requirements. Increasingly architects and specifiers are looking for improved performance and aesthetics. 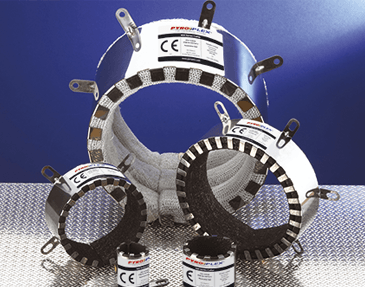 Recognizing these requirements and Pyroplex’s commitment to continual product development has resulted in the addition of thermally fused flippers. This manufacturing technique eliminates the concerns associated with inserted flippers being easily removed. The range has also been cycle tested to 100,000 cycles, to demonstrate durability, with no loss in working height or evidence of delimitation between the flipper and the carrier. The range is suitable for use on 30 minute and 60 minute fire resisting doorsets and have been tested in accordance with BS 476: Part 22: 1987, and demonstrated effective smoke sealing performance in accordance with BS476: Part 31.1 and BS EN 1634: Part 3:2004. The flippers also function as an acoustic seal and have achieved an acoustic rating of 43dB Rw when tested to BS EN ISO 10140-2:2010, when used as part of an overall acoustic system. The high level of product testing and third party certification under the Certifire scheme (CF822) provides sealing solutions that meet the ever increasing needs of the marketplace, both in terms of functionality and aesthetics. If you have any questions in relation to the installation or testing of solutions, Contact Us here or by telephone on 01905 795432.